Easterly in place at days 7-8 with a building high to our north and the key low pressure belt building in over southern europe* - No ultra cold 850's as yet but the blocks are falling into place. Expect run to run variation on the same theme post day 7- we need the majority of the EC suite to get on board to be sure the op runs have the right idea here. No deep cold showing as yet but these are far from your average December charts - Scandi high controlling the scene for the foreseeable it would seem. Hopefully the atlantic lows all slide under. Keep an eye on the key timeframe @ +120 to +168hrs on future model runs. *This run doesn't quite get the required 'Genoa low' in place to sustain the pattern but there is plenty of time for that to occur still. Looking like it’s going to be storm watch next week given the latest GFS output. Severe weather likely. A very violent depression showing for next Thursday. 3 out of 4 showing it over or near us this far out, one to watch, makings of unsettled weather the second half of next week and turning cold , ECM colder than GFS. It is worth running through the GFS ensembles for 6z this morning. Most all of them have some form of low pressure system almost right over us next Thursday. A number of them show an absolutely vicious storm. The track of this is quite similar across a good proportion of the ensembles while the intensity differs. Very interesting period of weather approaching. 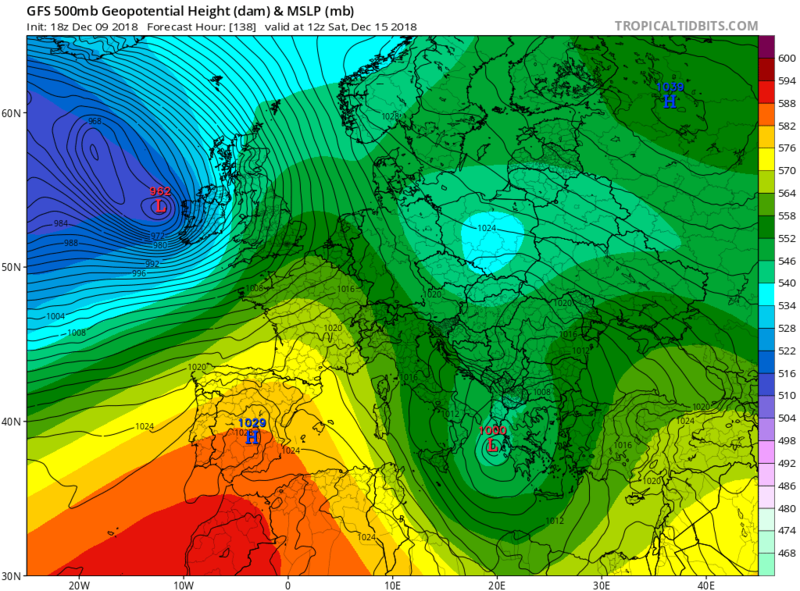 It’s going to be stormy I think we can almost say for certain but with current GFS forecasts showing these dartboard depressions running through Ireland rather than swinging N off the coast as often happens. They are bound to get one right eventually. The last few storms have been nowhere near as vicious as the +144s showed originally. Are they attention seeking or legit? As said Id say very windy next week for sure. Also if there is to be a vicious storm mid December would not be too unusual especially with the energised jet we are currently covered by. The GFS are notorious for doing this most winters, as you say they are bound to be right at some stage, but i wouldn't take too much notice of their depiction just yet. 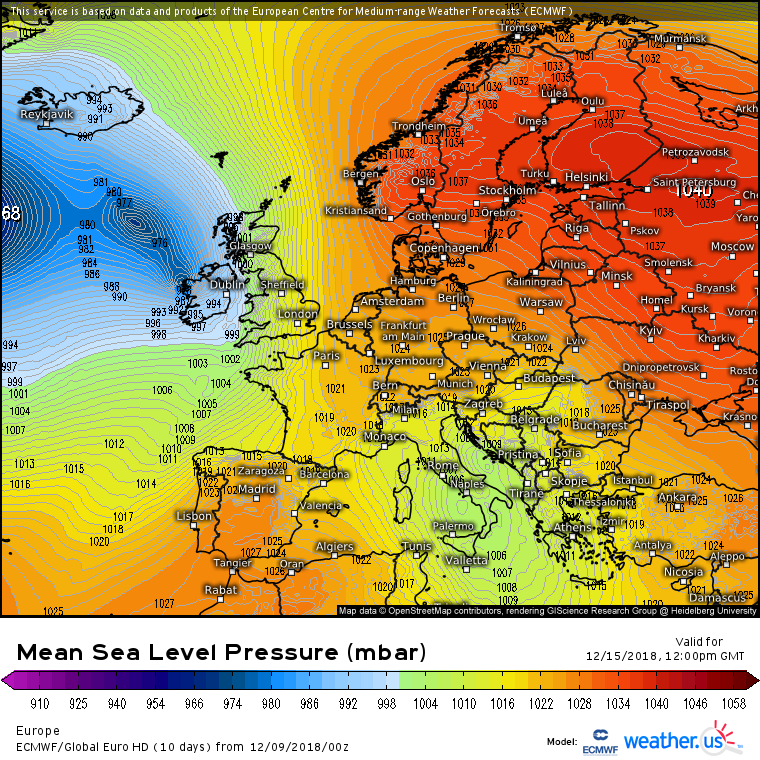 If the UKMO and ECM start modelling a vicious storm to hit us, then i'd take heed. I have a feeling this storm will end up tracking well to the north west of Ireland, and affect parts of Scotland more so than us . It's hard to take the GFS seriously right now. If the storm doesn't happen the way the GFS is showing then everything that follows the storm on the GFS will probaly be wrong. The chart MT was talking about for Monday week, what a stonker ! Of course out in FI so open to change but a good marker to see how the models are faring. Models differ after about next Thurs but all showing an unsettled spell which will get more clear as the days go on, potential for wet and windy weather with a mix of cold and mild air going through associated with fronts. Jet keeping S of us it seems steering in the weather in off the Atlantic . Ensembles continuing to throw out some wild solutions. ECM showing a storm off the Atlantic coasts on Fri and another deepening low Sat but that one not impacting Ireland , moving over the UK instead. No sign of the Storm positioned over Ireland for next Monday which was showing on the last run, just shows how changeable the charts are. 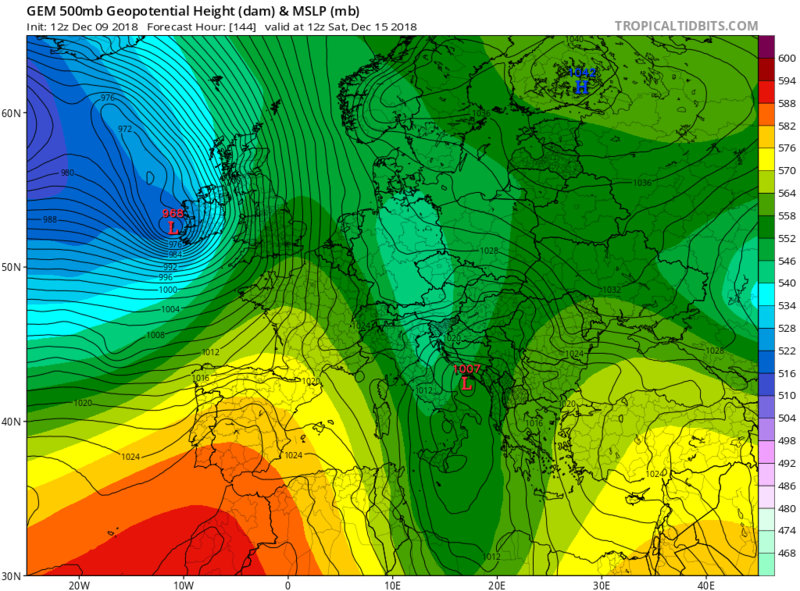 GEM very similar to the ECM with a Storm off the W coast Fri keeping strongest winds along the coasts and the second system on Sat bombing as it deepens on a track over Southern uk. To note two days ago most models were showing a storm very near Ireland for this Thurs, this stayed well out to sea with the fronts just making it over us . 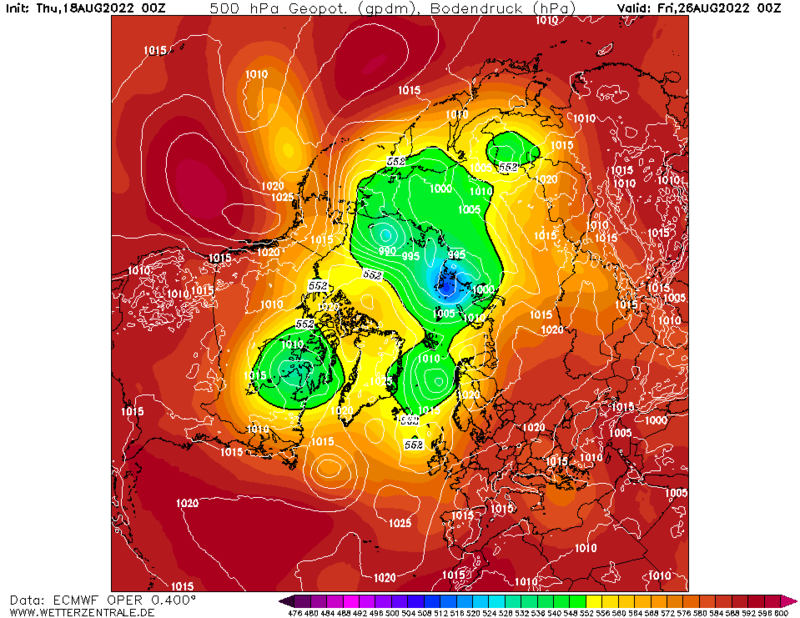 Very unpredictable towards the end of the week, very strong jet nearby will keep the models and forecasters busy. Last edited by Meteorite58; 08-12-2018 at 23:44. GFS has remained somewhat similar to yesterdays run with two vigorous systems next Fri and Sat ( on this run they remain just off the coasts ) . 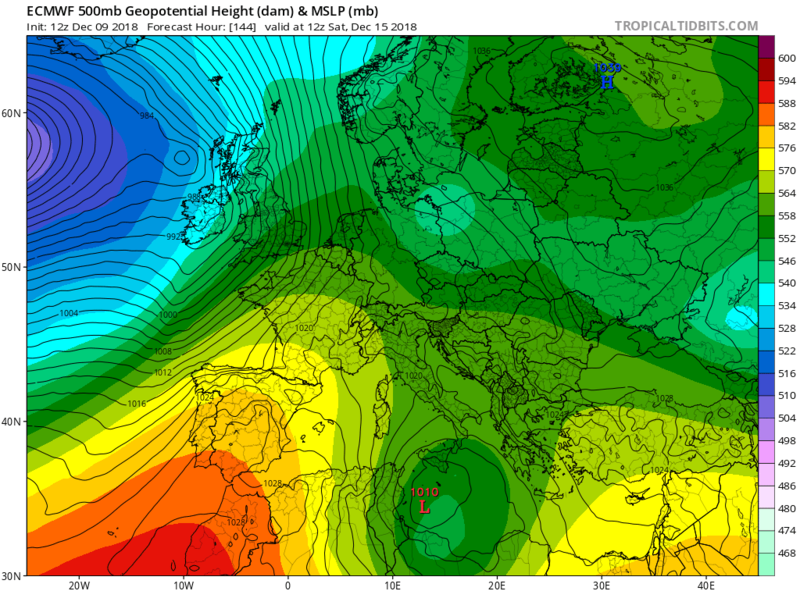 Gem now more like the GFS, ECM showing very stormy conditions on the W coasts next Sat. So chopping and changing but a trend of unsettled weather next weekend and possibly stormy at times. All new looking charts again this evening from the ECM, hardly worth putting up they are changing so much . 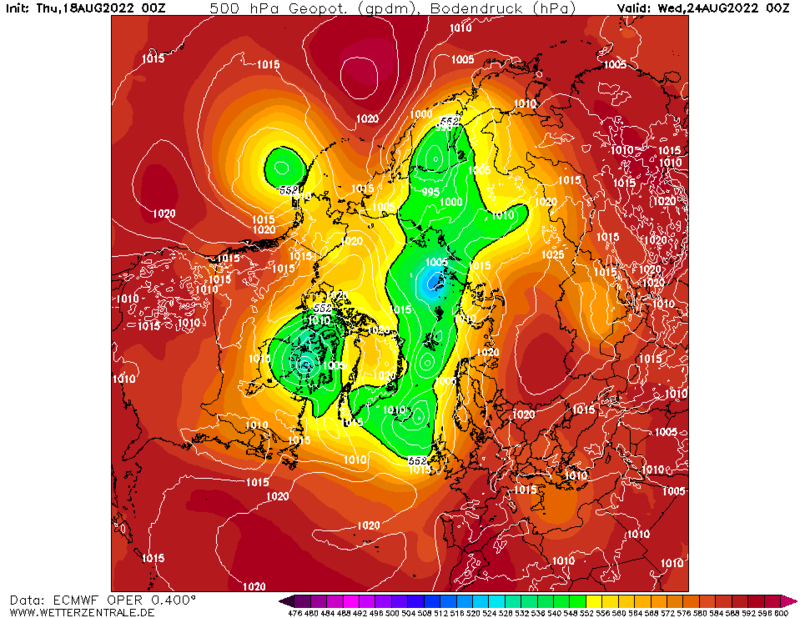 ECM showing the risk of storms receding this weekend, windy and wet. The Farming forecast showing very wet in the SW and NE this week from slow moving fronts that come up against Hp in Europe helping to block and stall them as they move slowly over Ireland . 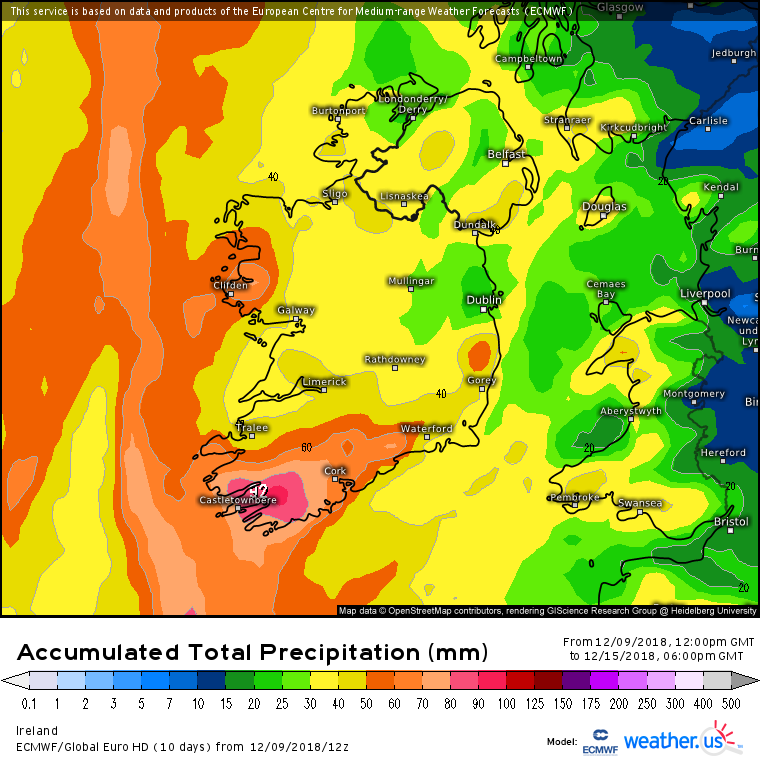 Met Eireann showed 100 mm possible in Valentia by the weekend . Still a big uncertainty how it pans out after Thurs. The GFS and ECM like chalk and cheese Fri and Sat coming. 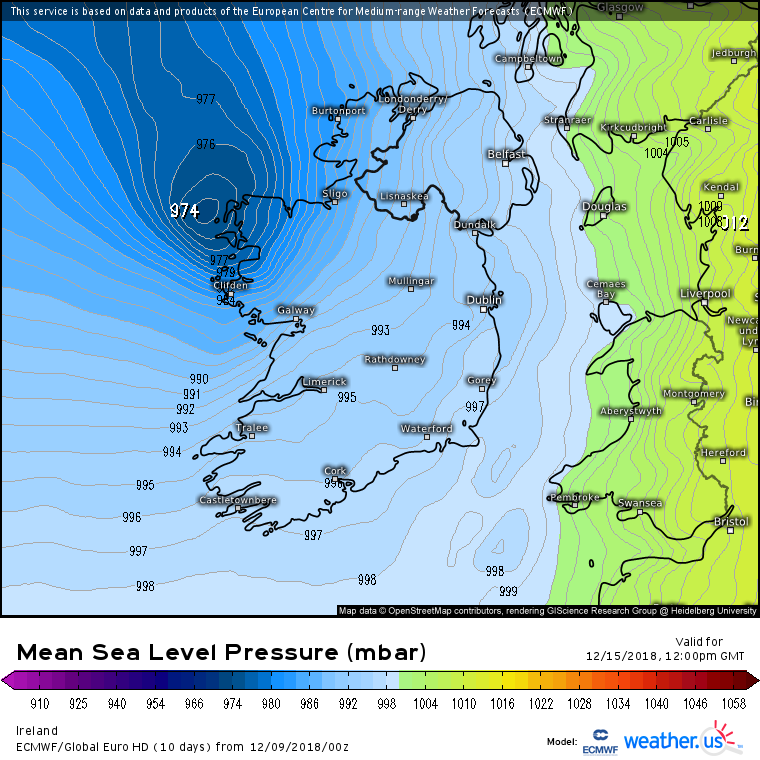 GFS bringing a Low close to Ireland on Fri and on Sat a very severe deep low with the strongest part of it moving up over Ireland , interesting that the GEM looks very similar to the GFS. Last edited by Meteorite58; 09-12-2018 at 23:24. Something to drool over. It’s not perfect but it’s good to see. I slight shift to the west with them uppers.